It was May 1990 when the history of Albornoz Palace Hotel officially began. Starting from that moment, the city of Spoleto was enriched by a structure never seen before. A hotel that represented and still represents an innovation for this industry in terms of ideas, objectives and services offered. The structure is buit on an urban plan draw up by the architect Carlo Aymonino, with the help of the architect Fulvio Balzani. In this way the dream of Tulli family was realized: to equip Spoleto with a multi-purpose structure. The Albornoz Palace Hotel was strongly wanted by Gian Carlo Menotti as a link between Festival dei Due Mondi and tourism. The Hotel immediately recived a great admiration. An extraordinary success among the several touristsand the citizens of Spoleto. Initially the novelty consisted of a large and modern Congress Center. Soon emerged the strong artistic nature that has always distinguished our history. A Back Step: Who was Cardinal Albornoz? A hotel with such as strongly artistic nature, could only be named after a characher who artistically enriched the history of Spoleto. Egidio Albornoz, who lived in the 14th century, worked at first under Alfonso XI of Castilla. He was forced to flee to Avignon by order of Pedro “El Cruel” and he was appointed Cardinal by Pope Clement VI. Among the tasks he performed for the State of the Church was to regain the Italian areas removed from the Papal States. One of the most important of these was the Duchy of Spoleto. After triumphantly recovering the territory, Albornoz ordered to build what today represents the symbol of the city. 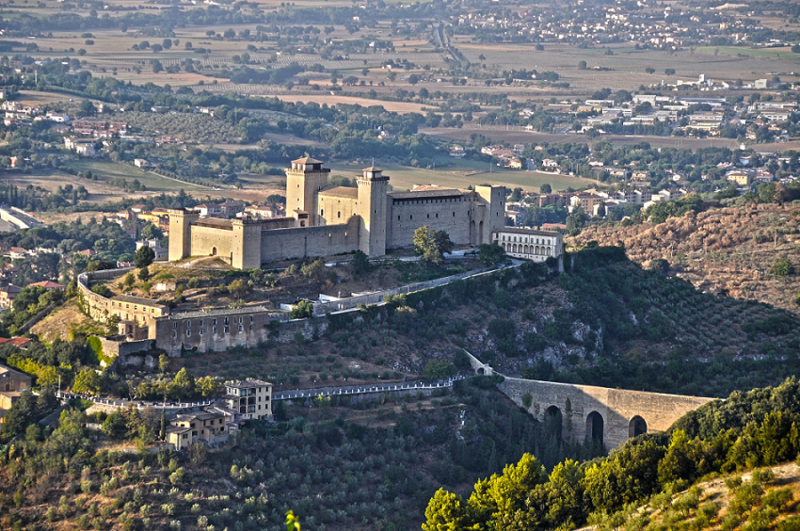 The Rocca Albornoziana, dated between 1363 and 1367, is the main testament that Albornoz left as a legacy in Spoleto. An imponing fortress source of inspiration for our history and perfectly admirable from our structure. With the aim of making the Hotel an engaging place from an emotional and cultural point of view, the “Atelier Project” started. It is an initiative that makes the hotel a veritable and constantly evolving artistic residence. Contemporary artists of world renown follow each other over the years in the creation of works of art in the spaces and with the spaces of the Hotel. All this makes Albornoz Palace Hotel an open and vital place. Art and everyday lifestyle are founded in a solid union that over time does not cease to be successful.